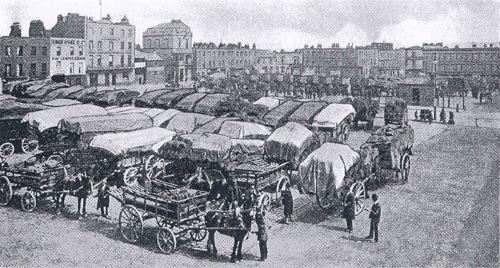 Throughout its existence the hay market operated for three days a week alongside a general produce market. The central cobbled market place, enclosed by cast-iron posts linked with chains, was surrounded by modest houses of varying styles. Most of the houses were of three storeys, some with a basement. 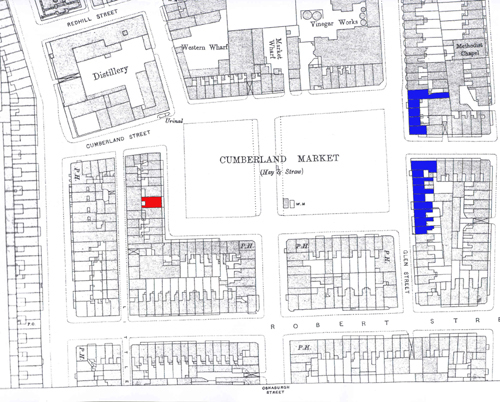 Although originally they do not appear to have had shops the lower floors of many were subsequently converted to business.2 Twenty-one separate businesses are recorded in Cumberland Market at the beginning of the twentieth century together with four pubs. The distinctive pedimented stables of Grimble’s Vinegar Factory, as described by Charlotte Mew, can be seen to the left. To its left are the premises of J. & A. Crew, stone merchants. 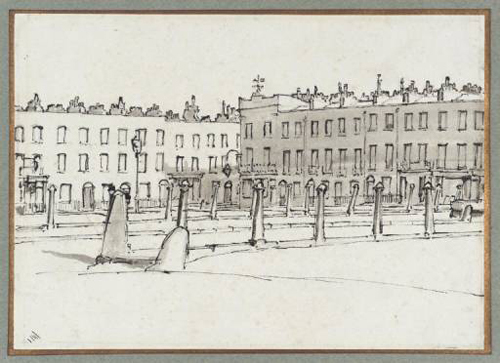 Glidden’s, the saddlers, original London premises can be seen to the right of centre and A.C. Savage, the chandlers, on the far right. In 1909-10 Sickert had taken a studio at No 21 Augustus Street, which he called the “Vinegar Factory” as it had been part of Grimble’s Factory.7 Here he taught etching. His “Cumberland Market” painting of ca.1910 which was made at the south end of Augustus Street shows the side window of Charles Chase’s bakers shop at No 24 Cumberland Market.8 In 1929 this was the premises of A.C. Savage, chandlers, and is shown on the far R/H side of the photograph of the North side of the Market. Harold Gilman – Cumberland Market ca.1915. A view from the centre of the north of the Market looking SE. The tall building is the King’s Head public house. The buildings seen in the drawing are marked in blue on the map. Whilst the boot repairer, house decorator and tailor might no longer have found it profitable to trade in the Market, by the beginning of the First World War there was clearly enough business for two artists’ colourmen to join the one that had already been supplying artists’ materials for many years. 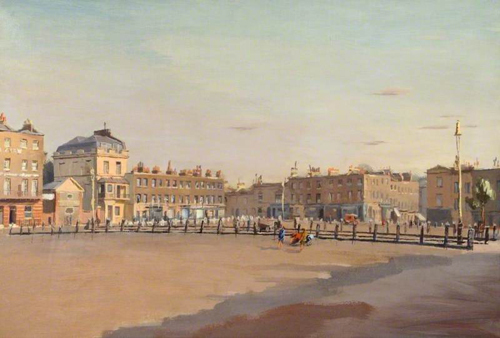 Amongst the artists with studios in the Market was William Roberts, who was to become a founder member of the Vorticists. He lived there briefly in 1913. Another writer attracted to the area was the American ‘Tramp Poet’ Harry Kemp, who rented two rooms in the Market in late 1913.12 It was there one morning, woken from an absinthe-induced hangover by the tap-tapping of a blind man in the Market below, that he wrote Blind. A few years beforehand, concerned by the poor conditions in which many were living Mary Neal, a philanthropist, set out to help girls working in the dressmaking trade. With Emmeline Pethick-Lawrence she established the Espérance Girls’ Club at No 50 Cumberland Market. This was open nearly every night of the week from 8 to 10 o’clock. 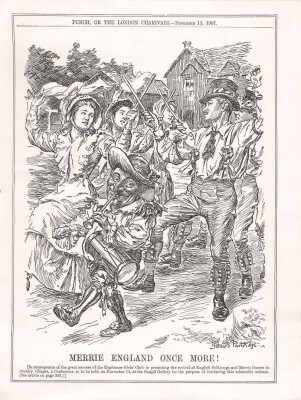 One evening every week was set apart for a singing class, another for musical drill, another for games, or sewing or cooking.13 Having heard of Cecil Sharp’s collection of folk songs in 1905 she asked him for suitable ones that might be taught to the girls. This proved to be such a success that he was asked to recommend dances to go with the songs. Within a short time the Espérance girls were putting on demonstrations around the country.14 Sharp collaborated with Herbert MacIlwaine, the musical director of the club, to produce the first of the Morris books. Mary Neal had been an early supporter of the Women’s Social and Political Union and the Espérance Club danced at many of their events. This proved to be one of the reasons for Sharp and Neal to fall out and although she went on to publish two Espérance Morris books, the Club closed during the First World War. Robert Bevan was to be the Club’s neighbour at No 49 during its last year and it is possible that his suffragette sister, Edith, was acquainted with it. 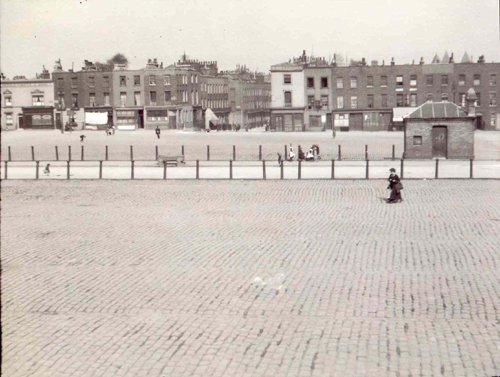 A market continued on the site right up until the late 1920s, and the last trading barges ceased sometime in 1930. Local businesses were in terminal decline and by 1931 only five remained and the King’s Head was the sole surviving pub.16 In the same year the buildings on the north side of the Market were demolished, including Grimble’s Vinegar Factory, and replaced by council housing. 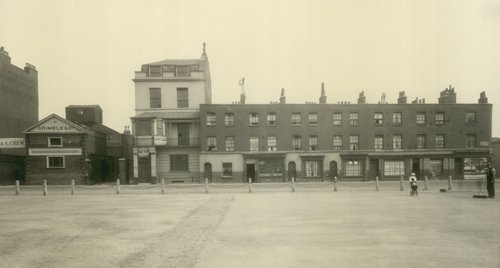 The remaining buildings were demolished in 1950 and in 1951 the Crown Commissioners sold the 32 acres on which Munster Square, Clarence Gardens and Cumberland Market stood to St Pancras Borough Council for the building of a housing estate. 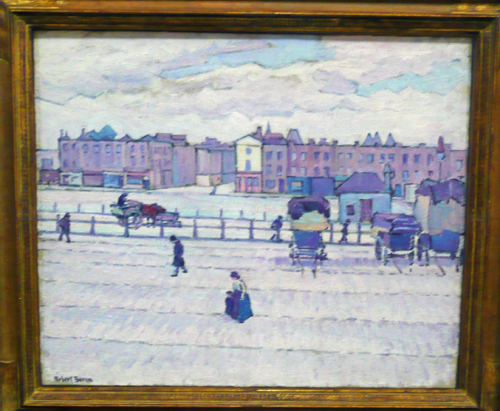 1This appeared in the catalogue of an exhibition entitled A Countryman in Town: Robert Bevan and the Cumberland Market Group, which was held at Southampton City Art Gallery, September 26 – December 14, 2008. The title “Straws from Cumberland Market” refers to the title of an article by Walter Sickert in Art News 20th January 1910. Sickert also delivered a lecture with this title in Edinburgh in January 1923 and later in 1924 in Hanley, London, Manchester and Southport (Anna Gruetzner Robins. Walter Sickert. The Complete Writings on Art. Oxford 2000. 189-190. 2Edward Walford. Old and New London. 1878. 301-309. 3J. & A. Crew were the sole agents in England for Craigleith Stone. This stone was used extensively in the New Town, in Edinburgh, and also in the construction of Euston Station. 4Raggi is perhaps best known for his statue of William Gladstone in Albert Square, Manchester. Foley is known for his statue of Prince Albert on the Albert Memorial. The latter was finished off by his pupil Sir Thomas Brock, who was knighted for his Victoria Memorial, in front of Buckingham Palace. 5C.R.W. Nevinson. Paint and Prejudice. Methuen. 1937. 106. 6Matthew Sturgis. Walter Sickert. A Life. Harper Collins. 2005. 402. 7Now in the Art Gallery of Ontario, Canada. 8Geoffrey Nelson appears in photographs of 1919 with Ottoline Morrell, Dorothy Brett and Mark Gertler. He had an exhibition of paintings at W.B. Paterson in 1929 and one of paintings and drawings of the South of France at the same gallery in 1930. In another of his reminiscences Roberts mentioned Christopher Perkins as having had rooms in the area. Perkins (1891-1968) was at the Slade with Dora Carrington, Mark Gertler, Stanley Spencer and C.R.W. Nevinson. 9This first appeared as part of the preface to Some Early Abstract and Cubist Work 1913–1920 (London, 1957); the present text is that reprinted as ‘William Roberts and Vorticism’s Year’ in William Roberts, Five Posthumous Essays and Other Writings (Valencia, 1990). © The Estate of John David Roberts. Reproduced with the permission of the William Roberts Society. 10Frank Rutter (1876-1937) art critic and Ethelbert White (1891-1972) artist. See John Yeates. NW1. The Camden Town Artists. Heale Gallery. 2007. 152. 11 It is not known if Bevan ever met Charlotte Mew although both attended meetings of the Imagist poets arranged by Ezra Pound and Richard Aldington (see Steven Foster. “Eidetic Imagery and Imagiste Perception”. The Journal of Aesthetics and Art Criticism, Vol. 28. No. 2 (Winter, 1969), 133-145). Bevan and Mew were third cousins, though they were probably not aware of it. 13Emmeline Pethick-Lawrence. “Working Girls’ Clubs” in W. Reason (ed.) University and Social Settlements. Methuen. 1898. 104. 14Janet Dowling. “Revival of Morris dance in early twentieth century”. Morris Federation Newsletter. Summer 2007. 17-19. 15Marion Brion. Women in the Housing Service. Routledge. 1995. 16See Kelly’s Post Office Directories for the first thirty years of the twentieth century. 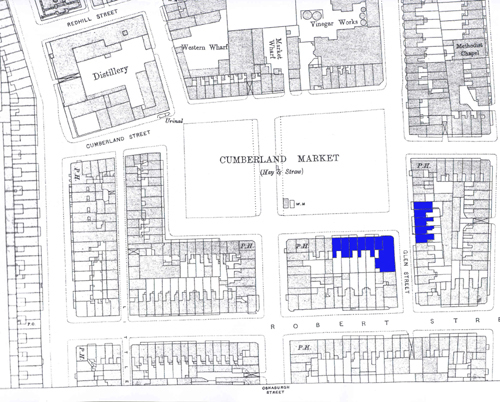 I am grateful to Mark Aston and his colleagues at Holborn Library for their help in researching Cumberland Market. 17“Hugh Compton & Alan Faulkner. “The Cumberland Market Branch of the Regent’s Canal“. Journal of the Railway and Canal Historical Society. 2006. No.194, 254-261. 18The London County Council Bomb Damage Maps 1939-1945. London Topographical Society. LTS Publication No. 164. 2005. Map 49. Thank you. I found the articles on Cumberland Market very interesting. I have been searching for many years for information on my 3xggrandfather a James Mundy (James King Mundy?) His birth I cannot find but I know that he lived in Barking Church Yard with family and worked in Cumberland Market as a Tailor. He took his own life in 1838 (cut his own throat) because of his failing business.No doubt this was due in part to the building of Euston Station. His wife carried on as a Seamstress for a few more years but unfortunately was declared bankrupt in 1849/50 and moved away from London. I would love to know at what number he was at and maybe then I could pick it out on one of the photos/paintings. Thank you Carol. What a tragic story. Yes, the coming of the railway caused mayhem and is described in several works of the time. I was able to find the trade directories from 1900 but not before, although I dare say they exist. My interest was specifically in the artists who had their studios there in the early 20th century, so I didn’t dwell too much on the early days of the Market. The best place to start your research would be Holborn Library. They were very friendly and extremely helpful. Good luck. This is all very interesting. My grandmother was born in Cumberland Market in 1910. She was a very talented musician, and it makes me wonder whether the Esperance Girls’ Club had any part to play in that. She would have been too young to have been a part of it; but it may well have had some formative influence on her.